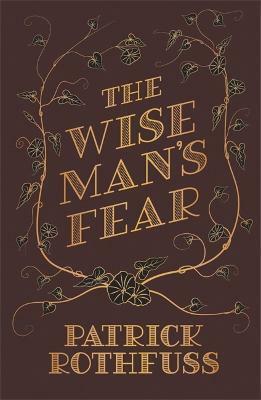 Sequel to the extraordinary THE NAME OF THE WIND, THE WISE MAN'S FEAR is the second instalment of this superb fantasy trilogy from Patrick Rothfuss. This is the most exciting fantasy series since George R. R. Martin's A SONG OF ICE AND FIRE, and a must-read for all fans of HBO's GAME OF THRONES. Picking up the tale of Kvothe Kingkiller once again, we follow him into exile, into political intrigue, courtship, adventure, love and magic ... and further along the path that has turned Kvothe, the mightiest magician of his age, a legend in his own time, into Kote, the unassuming pub landlord. Packed with as much magic, adventure and home-grown drama as THE NAME OF THE WIND, this is a sequel in every way the equal to its predecessor and a must-read for all fantasy fans. Readable, engaging and gripping THE WISE MAN'S FEAR is the biggest and the best fantasy novel out there. Patrick Rothfuss had the good fortune to be born in Wisconsin in 1973, where the long winters and lack of cable television encouraged a love of reading and writing. After abandoning his chosen field of chemical engineering, Pat became an itinerant student, wandering through clinical psychology, philosophy, medieval history, theater, and sociology. Nine years later, Pat was forced by university policy to finally complete his undergraduate degree in English. When not reading and writing, he teaches fencing and dabbles with alchemy in his basement. Patrick Rothfuss is an award-winning as well as Sunday Times and New York Times bestselling author. You can learn more about him and his work at www.patrickrothfuss.com, or by following @PatrickRothfuss on twitter.